The Journey to the first Maryhill She-ride. It all started in Santa Monica, California, where the 5 of us girls, Pam Diaz, Ishtar Backlund, Amanda Powell, Daisy Johannes, and myself, Marisa Nunez, were gathered together for a 2 week “vacation” from the IGSA races. We would get together to skate and hang out everyday. Amanda was nice enough to have us stay at her rad apartment and show us around her streets. We went out filming in Laguna one day with the Yuppie family and the Abec 11 crew. It was such a blessing to see all the Yuppies together shredding hard and giving their all for the camera. The girls and I might have our own little part in their video too, which we´re extra stoked about! The idea of a documented skate trip to the She-ride came about quite spontaneously and we got to work right away. We went out for a film session on Venice Beach and got everything we needed for our trailer. Pam knew exactly what she wanted, and directed us in front of the camera like a boss-woman. It was inspirationally rad. We skated all day and watched the sunset on Venice as we discussed plans for our trip. The next day, Amanda and I had to go to a shoot in Hollywood for a commercial that we are skating in. We´re really stoked on this because we´ll be able to get our style of skating and our sponsor´s products on national television. 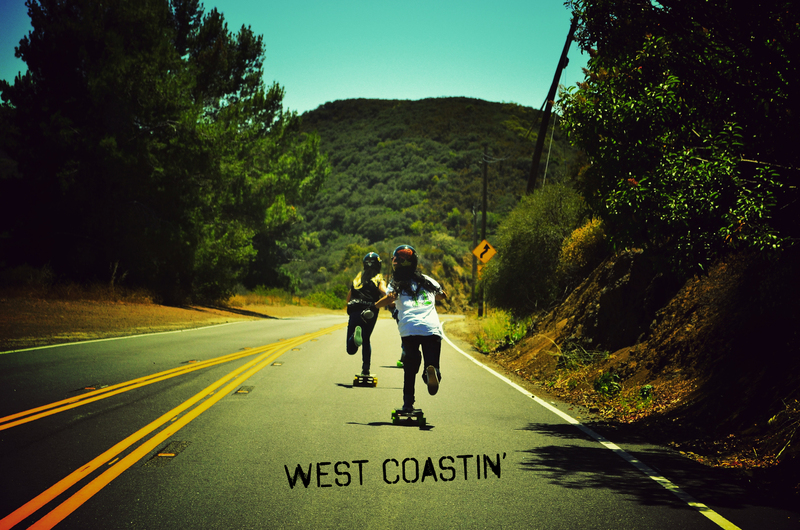 Hooray for Longboard Girls Crew´s Youtube videos inspiring Hollywood for commercial media! This is epic. In the meantime, Ishtar, Daisy and Pam were hard at work at the local coffee shop getting all the emails out to potential sponsors for our trip.These girls are some serious go-getters, they could rule the world if they wanted to… seriously. That night, Pam stayed up until 4 in the morning putting together the sponsorship package presentation, and the following night, she stayed up until 7 in the morning putting together the trailer video. In only a couple of days we were able to put together a sponsorship package presentation, filmed and edited a trailer video, and got in touch with everyone that we needed to. Goes to show, that will power and wanting something bad enough could bring you anything you work on. The countdown is at T-minus 2 days until we get the show on the road, destination: Maryhill She-ride. We are 5 girls and will be traveling, skating, filming and editing these videos all ourselves. Stay tuned and get ready ladies, we´ll see you there! Endless Roads 2 – The Island from Juan Rayos on Vimeo. In Episode 2 the ladies head to Mallorca for more gnarly hills, free ride, and a quick display of road rash. Marisa Nuñez and Amanda Powell give the details on their set ups and prove they have the coolest job in the world. Endless Roads 1 – Yellow Horizons from Juan Rayos on Vimeo. The first in what is now a series of 3 videos featuring the Longboard Girls Crew and Daddies Board Shop team riders Mariza Nuñez and Amanda Powell in an epic road trip through Spain.